Trump stood on a White House balcony to welcome families to the event, alongside Melania and Barron and someone who I assume was screaming for ten minutes straight inside a silencing bunny suit. 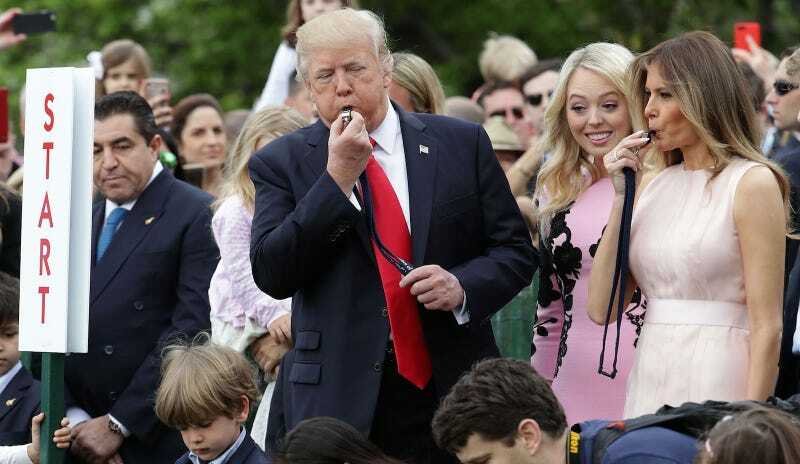 The president thanked his wife in particular, as the official host of the Easter Egg Roll according to CNN. Sure. She loves this. “We’re going to come out and join you and enjoy your company for a roll, a great Easter egg roll. And I don’t know if people are going to be successful, but I know a lot of people down there are going to be successful. I’ve seen those kids, and they’re highly, highly competitive,” said Trump, obviously talking about himself. How’d Trump enjoy himself? Politico shared a clip of Mr. President signing a fan’s hat, then appearing to throw it randomly into the crowd while the fan yells “No!” He also seems to call a pen a “hat,” which is worrying.